Reethi Faru – a stunning tropical Bio Luxury island paradise with white sandy beaches, easily yielding to green shallow waters around the reef that merge with the infinite blue ocean. There is more to the resort than sun, sand and sea and the experience of staying here will outdo the tranquility of the surroundings. Located on the island of Filaidhoo in Raa Atoll, this breath-taking island seamlessly blends intimacy and privacy and measures just 600m x 350m. 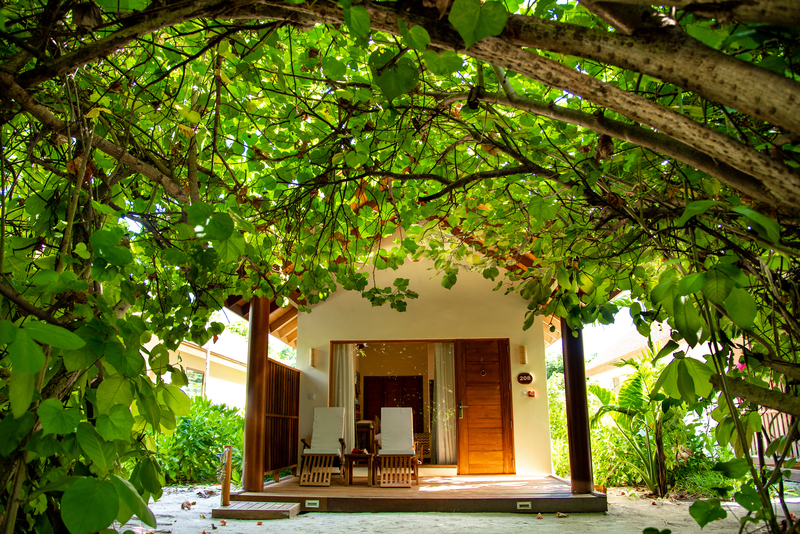 Reethi Faru is a private boutique resort with an enviable pedigree for conserving the natural beauty of the islands and sustaining the ecosystems upon which the fragile coral reef relies. Enjoy the most special occasions and memorable moments of your life amidst the romance filled tropical ambiance of Maldives. With ceremonial beach front set-ups to private dinner set-ups, the Reethi Faru Guest Relations team can help plan your picture-perfect moment in paradise with a dream-like setting created in a private section of the beach where the bonfire is assigned to mildly offer the dinner lighting amidst flutes of champagne. Alternatively, you can choose your villa's deck, where personalized service starts with the finest champagne and the bespoke menu unfolds the magic. Freestanding or connected two-bedroom suites built with commitment to conservation at the heart of their traditional design. We believe in using as many locally sourced and created materials such as bricks made from recycled soil, bio consciously treated sustainable teak from Indonesia and lacquer work and ceramics from the region. The Garden Villas were designed to complement the natural beauty of the island and each villa boasts spectacular views of local flora and offers the tranquility of your home. Our collection of freestanding beach-front villas has the most luxurious interior size. Their truly private setting will encourage you to live the 'Me' time amidst natural surroundings, that you may have always yearned for. The Water Villas are your space, with a sky that is your own. If gazing at the stars or soaking the view holding hands in a private setting sounds romantic, then this is it. These Villas come with beautiful natural lights, wooden ceiling and warm decor often brushed by fresh breeze. We have an array of experiences to offer for couples to enjoy. With arguably one of the best Water Sports Centres in the Maldives, it offers something for everyone. Our team of instructors assists you in your adventure using our state-of-the-art equipment. Pull out the jet ski, slide the catamaran into shallow waters, push your canoe, go kite surfing or choose instead to enjoy romantic sunsets or jump aboard our catamaran for an authentic Maldivian fishing adventure and complete your perfect day by bringing your catch back to barbecue your own dinner. Our PADI & SSI accredited five-star rated Dive Centre can open an undersea world of submerged islands, dramatic overhangs, underwater walls and sea caves in this far-flung region of the Indian Ocean. Whether diving or snorkelling, you can ‘relax under pressure’ with our multi-national team from Sea – Explorer. Our Coconut Spa is designed to provide you with a relaxing ambience, comfortable interiors and rejuvenation at its finest. Located within a coconut grove on the west side of the island, the spa comprises of all elements of self-pampering. Luxuriate in our steam room, sauna, jacuzzi or relaxation area while you wait for your treatment or after for a perfect pampering session. Choose to maintain your fitness regime at our ‘Country Club in Paradise’ Sports Complex, which offers a fully equipped gym and yoga facility. The Sports Complex also includes an indoor squash and basketball court and two outdoor tennis courts. We offer a myriad of culinary experiences spread across the island between six restaurants and six bars, presenting scrumptious delicacies, fragrant, savoury cuisines and fine wines to indulge in. The buffet-style main restaurant with airy setting, relaxing ambience, a contemporary theme and variety that matches the preferences of the discerning travellers from across the continents and the main bar, The Harugé is semi-enclosed social hub with an open-air deck by the beach, offering cocktails and alcoholic/non-alcoholic beverages., It hosts evening entertainment and has an attached games room. The 24-hour Dhiyavaru Restaurant and Bar with à la carte menus and drinks to enjoy by an exclusive causeway that connects you to beautiful restaurants constructed on stilts over the turquoise lagoon or choose Reethi Grill to feel the warm sand through your feet while you sit in your cabana to hear the gentle movements of the ocean lapping effortlessly only to be disrupted by the crackling beach bonfire. Raalhu Café and Veyo Bar situated by the pool offer plenty of sunlight and the backdrop of a gorgeous island with snacks such as crepes, burgers, pizzas and more. Beach bars around the island guarantee intimacy and service by renowned connoisseurs.